For use with V.Smile Motion Active Learning System. Additional games to extend the play, games are age specific, appeal to both boys and girls and feature different educational content. See in store for full range of titles available. Can be used on existing V.Smile Consoles, but the motion feature will not be present…. This toy costs approximately £2.99 (for the latest and best prices make sure you check our retailer list for the V.Smile Motion Disney Fairies above). 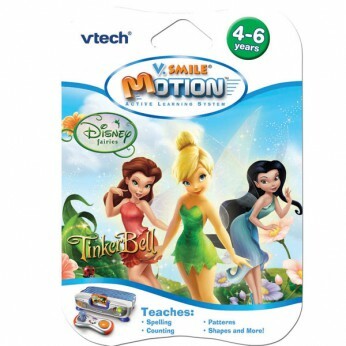 In our review of V.Smile Motion Disney Fairies we classed it as being suitable for ages 3 years, 4 years, 5 years but recommend you check the manufacturer specific advice before purchasing.